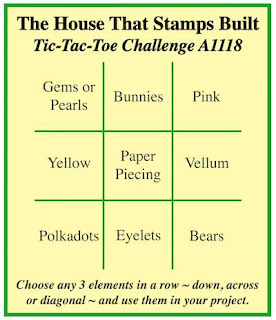 It's time for another Tic Tac Toe challenge over on The House That Stamps Built. Choose three items (across, down, or diagonally) to include on your creation, then come by the blog and link it up! I chose the top line -- Pearls, Bunnies, and Pink! I started by creating a lattice background for this fun little shape card, but instead of using all white paper strips, I changed it up with some pastel colors! Note: If you'd like to make a shape card like mine, be advised that it's very difficult to cut through all the layers with nestabitlites. I recommend cutting your lattice piece into a square and then adhering the white frame over top. Love your mini tutorial on lattice work - patience is a key here. Worked perfect for this Tic-Tac-Toe challenge. What a beautiful card, your weaved piece is stunning! Absoutely adorable, Esther! The detailing and handmade weaving is amazing. I've never done the weaving before, but may have to give it a try. So cute Esther. Love the pretty twine bow around his neck! Thanks so much for joining in the fun at our Double D ‘TWINE’ challenge! Good Luck and we hope you’ll come back often. Gorgeous creation, the weaving looks fantastic! So sweet, love the detail in the bunny and the lattice background is so neat! Very pretty Spring card...thank you for joining our challenge at Double D! Oh he is so sweet, love how you tamed him with the Twine collar. That weave background is fabulous! Thanks so much for playing along with us at The Double D Challenge Blog, Twine, Donna DT Member. Wonderful handmade lattice in the background! Awesome job with the challenge. What a sweet sentiment! Love the paper weaving! the woven background is so perfect for an Easter card! I love it! 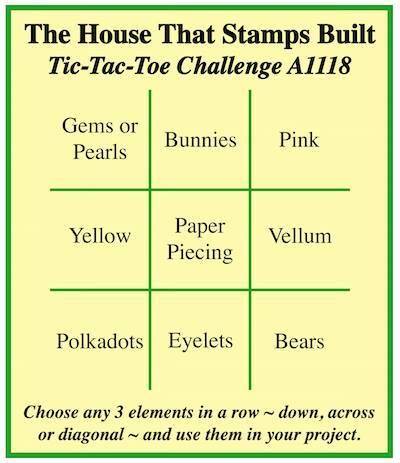 Good luck in the HeARTful Stamping Challenge! This is very cute! And that woven background is really cool!